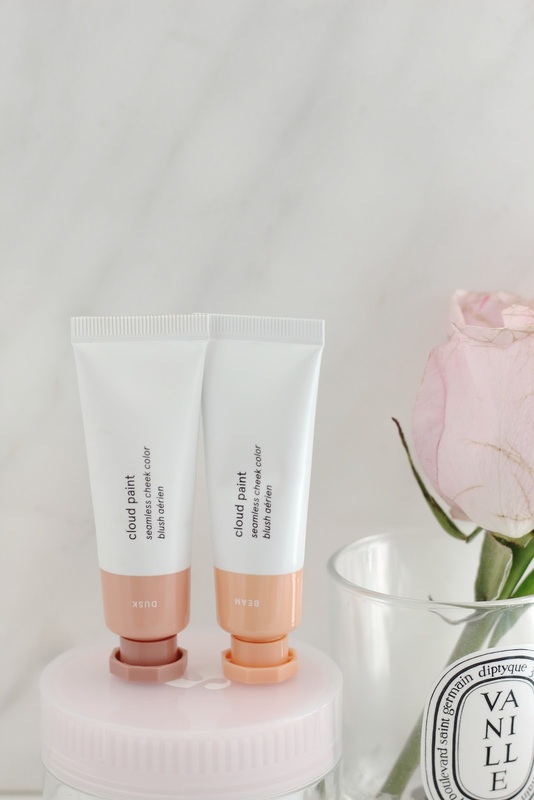 Glossier First Impressions. | By Millie. The excitement is real people...I am the official owner of Glossier products! I know how hyped this brand is, and since it's launching in the UK next month I wanted to add my own review to the sea of existing blog posts. I was lucky enough to attend a dinner with Glossier to celebrate their UK launch and they were so kind to give me some products to try. Yes, I did get them for free, but that isn't swaying my opinion at all, and the brand hasn't paid me to make this blog post, I've simply done is as I'm so excited to be trying out their products and want to share my thoughts with you all. OK, enough rambling, let's get in to the first impressions! I'm going to start with skincare, and they have some lovely bits on offer from cleansers, to masks, and everything in between - except an eye cream! I was really excited to receive a few skincare items to try out as the packaging is gorgeous, super photogenic, and I've heard great things. They do cater to many skin types and I feel like their skincare branding and formulations are very gentle on the skin and fit well together as a routine. This was one I was very happy to try. Cleansers are my weakness, I own way too many, but it is an important step so it's justified right? This is a very fuss-free, simple cleanser which works great for all skin types. It doesn't lather up on the skin, it remains a lovely hydrating light-weight formula to help remove dirt and impurities. I use this morning and evening and I love how it leaves my skin feeling. If you're after a new cleanser to try, definitely consider this. I have yet to use it for makeup removal, but will report back on that! The scent is beautiful too, it's got some lavender in there so very calming and spa-like. If you suffer with dry, dehydrated skin, this is an absolute must-have. It's a very thick serum, but sinks in beautifully. This, paired with the moisturiser I'm going to be talking about in a moment, is a match made in heaven. I've been using this in the morning to give my skin a bit of a moisture boost before going in with makeup. I find it leaves my skin looking and feeling amazing all day. It's quite a small bottle though, so I think I'm going to get through it quite quickly which is a shame. So many people said that the original priming moisturiser was too drying on their skin, so I'm really happy I got to try out the riche formula. I can confirm this isn't drying in the slightest. It's a thicker cream, so you don't need a lot, and the smell is similar to the cleanser, very calming. This makes my skin feel like velvet, it's incredible. If I'm having a no makeup day, this on top of the serum makes my skin feel beautifully soft and hydrated all throughout the day. The pot feels very heavy and luxurious which is another plus point. As far as the priming aspect goes, it does make my makeup sit beautifully, but I haven't noticed a difference in longevity. Now, we're going to move onto makeup. There's still a few bits I want to try, but so far I'm really impressed with the products I have. 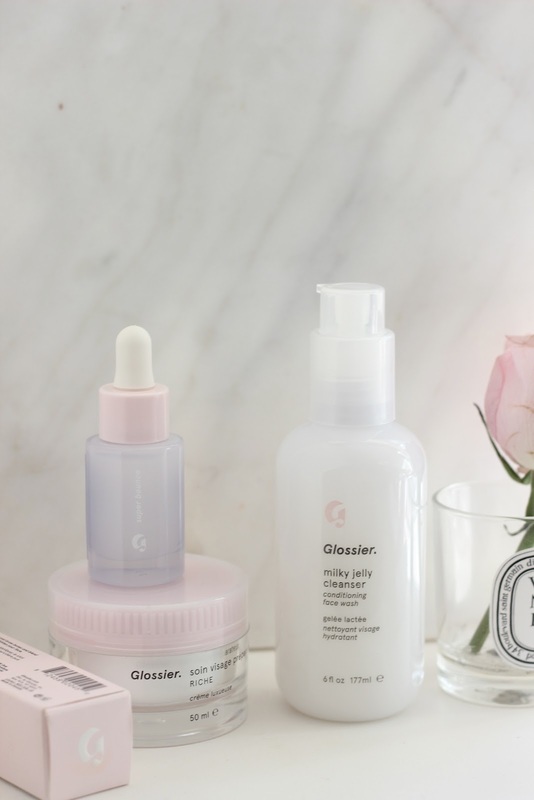 Glossier is all about natural makeup and glowing skin, and their products are certainly tailored to create that look. I personally really love that as I don't wear a full face of makeup every single day. If you're more of an intense highlight, bold brow type of person, their makeup selection may not appeal to you as it's far from that. I always use a brow gel, so I was very excited to try this out. It's a very conditioning formula, initially I was slightly put off by the thick white formula, but it doesn't translate on the brows at all. It's not sticky, nor does it leave my brows feel very crispy. I would love to try the tinted versions as I LOVE a good tinted brow gel, so let me know your thoughts if you've tried those. The wand is lovely and small, so it's really easy to coat every brow hair. I'm slightly on the fence about these. There's one I love, but the other two shades I can't really get on with. The shade Moonstone was a little bit disappointing, it's simply a clear gel, nothing special at all I didn't think. These have an odd formula too, their quite gel-like so they do sit on the skin and can feel sticky if you apply too much, I don't find them uncomfortable to wear though. Moonstone does have a slight iridescence to it, but it's definitely very subtle and I do prefer the other, more champagne shade, Quartz. Quartz has more colour pay off and it's more noticeable on the skin. It's still subtle, but the shine it gives off is really beautiful and dewy, it's definitly the one I would recommend for light-medium skin tones. Topaz is the last of the three and would work great on deeper skin tones. For me, I couldn't really work with this, it's too shimmery to use as a bronzer, and too dark to use as a highlight. I did mix it in with my Clinique Chubby Contour Stick to give more of a glowy bronze finish to the skin, and it did work well for that I have to say. Is it something I'm going to reaching for a lot though, probably not. I love these cream blushes so much! A little goes a long long way, which is good as they are quite small, but they really pack a punch. I have two shades, Dusk and Beam. The former is a lovely natural nudey pink, it's on the deeper side so I think would work well on a lot of skin tones. I use a really light hand with this shade but I love the natural flushed finish it gives. Beam is a coral shade, my personal favourite. There's no shimmer in these blushes so definitely add a highlighter if you're after a glowing cheek. The shades do come out darker than the colour of the packaging so keep that in mind when ordering online. For everyday wear I love working with cream blushes, and these are no exception. I tend to apply them from the back of my hand with a small duo fibre brush, and blend out with a beauty blender. They blend seamlessly this way and I find and you have more control over the product. So, there we have it. 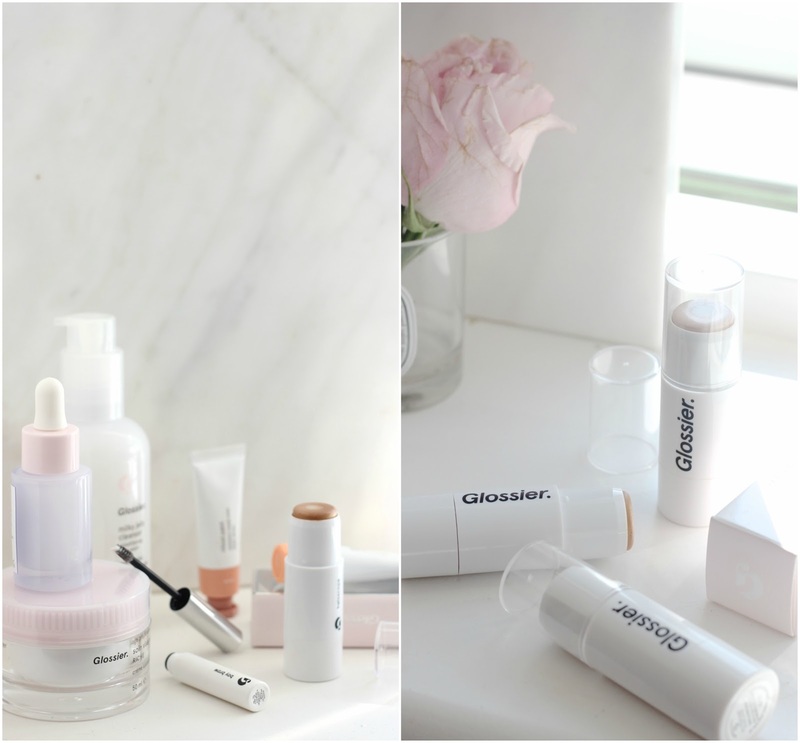 My thoughts on Glossier. Safe to say I'm in love with a lot of the products I've tried and I cannot wait to get my hands on a few more goodies once they launch. I'm thinking the Generation G lipsticks and maybe one or two masks? 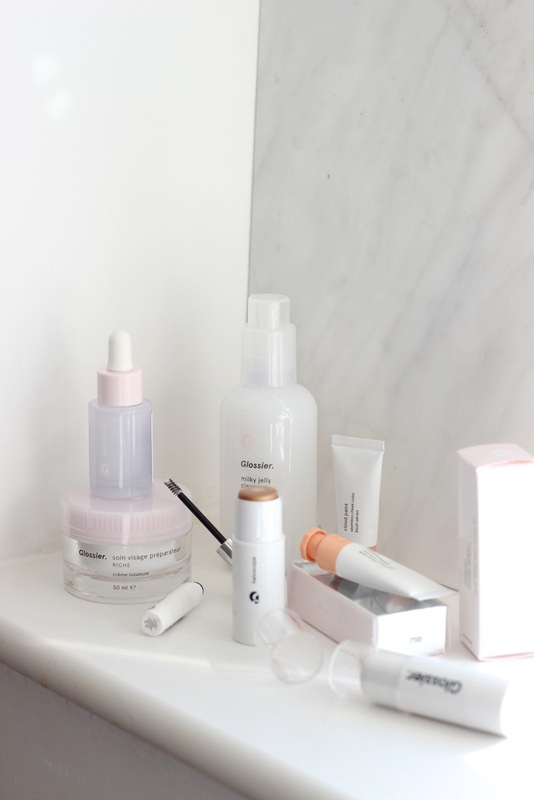 Let me know what you've tried from Glossier and the products you love, and if you will be jumping on the bandwagon once they hit the UK!